Did you know your pet could be allergic to their own food dish? Or even the shampoo you’re using to wash them! I needed to find this solution……………. I was shocked to think that just the simple food bowls I was using would be causing a problem. Known as chin acne, or feline acne, it’s not actually an acne that is the result – it’s an allergy to the chemical compounds in the plastic bowl. And there are preventions to this……Bamboo Fibre! Bamboo fibre bowls remove that chemical element which causes the acne, and not only that, they are biodegradable – unlike plastic! 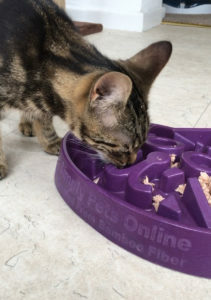 Our Cat Puzzle Feeder fits the bill perfectly – just ask Piper……she shows you how to do it in this short video like a pro! 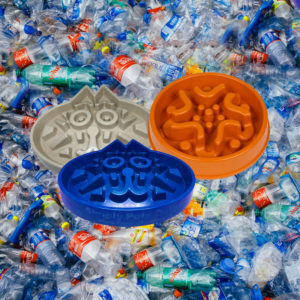 So by purchasing Bamboo Fibre products over plastic – you’re not only helping your pet, but also helping the planet! Stainless Steel, ceramic, and glassware can also be a great alternative, although it’s environmental footprint is not a great advocate. And poor things are just as susceptible as we are to hayfever triggers such as pollen and grass-seed – we wait ages for a nice Spring day, then on come the sneezing and itchy eyes! Allergies stem from the same immune response system in our pets as they do in humans. And they of course can be year-round, though when the weather warms up and the plants begin to pollinate this naturally increases their risk of symptoms. Feline asthma is also very common, and can lead to a number of other health concerns. Whilst it is unfortunately incurable, it can be managed with veterinary support. 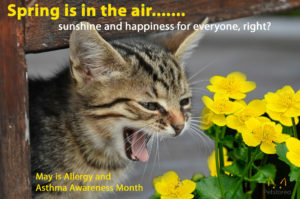 BUT – did you know the most common pet allergies come from food, fleas and parasites, dust, pollen, cigarette smoke, and household items such as plastics, shampoos, and cleaning products. 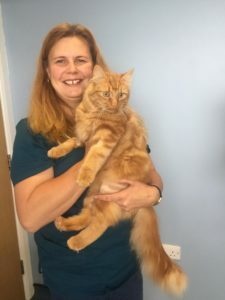 And as we all know, prevention is better than cure – so reducing dust from homes, changing litter types, perfumes, air fresheners – all can make a huge difference to reducing the exposure for your cat. 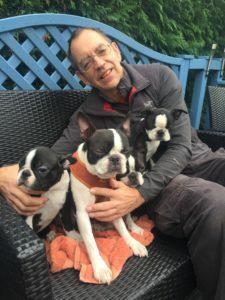 It is the same in the canine world; there are so many different allergens out there it can be very difficult to pinpoint; especially as more symptoms present as itchy skin or chronic ear infections, it can often be overlooked as to a common cause. So what do our in-house expert Co-Founder’s think is the best way to help our pals? Previous Previous post: Easter treats for Cats and Dogs – Fun and Free From Chocolate! Next Next post: A Vegan diet – should they…. ?